Gamma-ray bursts are unexplained intense flashes of light that occur several times a day in distant galaxies. The bursts give off more light than anything else in the universe and then quickly fade away. They were first detected in the late 1960s when instruments on orbiting satellites picked them up. No known explosion besides the big bang is more powerful than a gamma-ray burst. (The big bang is a theory that explains the beginning of the universe as a tremendous explosion from a single point that occurred 12 to 15 billion years ago.) 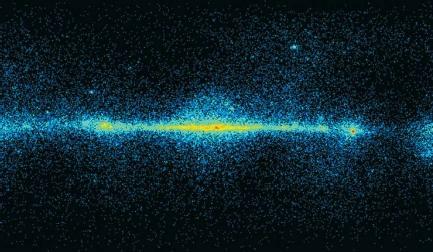 Gamma-ray bursts are mysterious because scientists do not know for sure what causes them or where in the sky they will occur. bursts tend to be observed as shorter, since only the higher parts of the emission are observable. 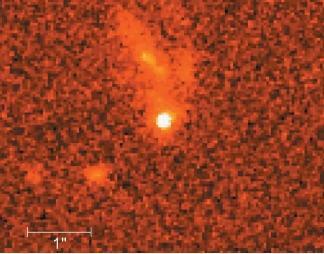 Astronomers believe that each type of burst may come from a different type of cosmic explosion. To learn more about the sources of gamma-ray bursts, scientists at the National Aeronautics and Space Administration (NASA) studied the time histories of short and long bursts. They did this by counting the number of gamma-ray pulses (particles of light, called photons, that arrive at about the same time) in each burst, and by measuring the arrival time of lower-energy and high-energy pulses. The astronomers learned that short bursts had fewer pulses than long bursts and that their lag times were twenty times shorter than those of longer bursts. This suggested that both long and short bursts were produced in physically different objects. Big bang theory: Theory that explains the beginning of the universe as a tremendous explosion from a single point that occurred 12 to 15 billion years ago. Black hole: Single point of infinite mass and gravity formed when a massive star burns out its nuclear fuel and collapses under its own gravitational force. Gamma ray: Short-wavelength, high-energy radiation formed either by the decay of radioactive elements or by nuclear reactions. Neutron star: The dead remains of a massive star following a supernova. It is composed of an extremely dense, compact, rapidly rotating core composed of neutrons that emits varying radio waves at precise intervals. Supernova: The explosion of a massive star at the end of its lifetime, causing it to shine more brightly than the rest of the stars in the galaxy put together. Scientists' theories about the source of gamma-ray bursts are many. Some believe that they are a result of a fusion of black holes or neutron stars. (A black hole is the remains of a massive star that has burned out its nuclear fuel and collapsed under tremendous gravitational force into a single point of infinite mass and gravity. A neutron star is a dead remnant of a massive star; a star dies when it uses up all of its nuclear fuel.) Others believe that supernovae or hypernovae are the cause of a gamma-ray burst. (A supernova is a typical exploding star; a hypernova also is an exploding star, but with about 100 times more power as that of supernova.) In 2000, two sets of astronomers found evidence of an iron-rich cloud near gamma-ray bursts. Since stars at the supernova stage produce iron, the scientists theorized that a supernova emitted the iron cloud just before the gamma-ray burst. The power of a gamma-ray burst is astounding. A satellite launched by NASA in 1991 detected gamma-ray bursts at a rate of nearly one a day for almost two years. The energy of just one burst was calculated to be more than 1,000 times the energy that the Sun would generate in its almost 10-billion-year lifetime. (a galaxy that includes a few hundred billion stars, the Sun, and our solar system) was formed, or 6 billion years before our solar system was born. Viewed another way, this particular gamma-ray burst has traveled through 90 percent of the age of the universe. Scientists study gamma-ray bursts as a way of helping to better understand the evolution of the universe.